In 1846 Major F. Lockwood built a dam and sawmill on Pettibone Creek northeast of Livingston and Harvey Lake Roads. This sawmill supplied lumber to Highland's earliest settlers until it burned in 1863. In 1867 Chester Chatfield build a cider mill at the same location. He sold it two years later to John B. Crouse who used it to make both cider and vinegar. A succession of owners followed. By 1877 production had reached 2500 barrels per year. After 1880 the mill supplied vinegar to the Highland Pickle Works. The mill remained in operation until 1902. Today only the dam and millpond mark the spot where the sawmill and vinegar works once stood. In 1856 Lockwood built another dam and gristmill on Pettibone Creek north of present day M59. It is said wagons sometimes lined up ten deep in front of the mill while farmers waited for their grain to be ground. The miller used a "toll box" to measure and take a portion of each farmer's grain as payment for his services. In later years this mill was owned by John Maugh who operated it from 1902 until the mill was sold and razed in 1943. The Highland Township public library is in the background. platted in 1846. Originally called the Village of Highland, it was located along Harvey Lake Road. The gristmill, the sawmill and the cider mill, all on Pettibone Creek, gave the community the new name of Spring Mills when a post office was established in 1857. When the railroad was built in 1871 the post office and village businesses relocated one-half mile west to Highland Station. Spring Mills and the mills slowly faded into history. Erected 2009 by Pettibone Creek Chapter No. 777. Location. 42° 38.614′ N, 83° 36.627′ W. Marker is in Highland, Michigan, in Oakland County. Marker can be reached from the intersection of Town Center Drive and Highland Road (Michigan Highway 59) when traveling north. Touch for map. Marker is in front of the Highland Township public library. 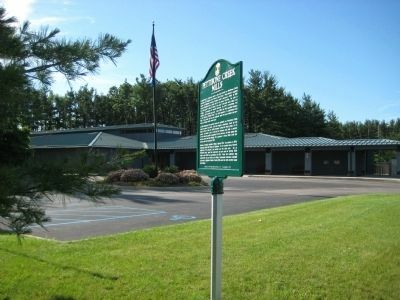 Marker is in this post office area: Highland MI 48356, United States of America. Touch for directions. Other nearby markers. At least 8 other markers are within 4 miles of this marker, measured as the crow flies. The Village Of Highland Station (approx. 0.6 miles away); Rowe House (approx. 2.4 miles away); The Haven Hill Getaway (approx. 2.4 miles away); Edsel Ford's Leadership (approx. 2.4 miles away); Haven Hill Lodge (approx. 2.4 miles away); Haven Hill Carriage House (approx. 2.4 miles away); Haven Hill Farm (approx. 2.8 miles away); Haven Hill Gatehouse (approx. 3.4 miles away). More. Search the internet for Pettibone Creek Mills. Credits. This page was last revised on June 16, 2016. This page originally submitted on July 3, 2009, by F. Robby of Baltimore, Maryland. This page has been viewed 1,013 times since then and 5 times this year. Photos: 1, 2. submitted on July 3, 2009, by F. Robby of Baltimore, Maryland.